Having an annual routine physical examination is a good idea even if you aren't experiencing any discomfort in your body. If you notice any changes in your body it is especially important to seek medical care. A specific physical examination to investigate the liver or the gastrointestinal tract is called an abdominal gastrointestinal examination. Some patients find it helpful to write down the answers to these questions prior to the appointment. It may also be useful to collect information about your medical history and your family's medical history prior to the appointment for better recall. It is really important to answer all questions asked by a doctor as accurately and with as much detail as possible. Be specific when answering the doctor's questions. For instance, instead of saying "I drink socially", try to provide information on the actual quantity of alcohol and frequency for which you drink. Don't forget to inform your doctor if you take any medication regularly or use any herbal supplements. If you are experiencing any pain, notice symptoms or are feeling unwell, be sure to speak to your doctor about this. Sometimes symptoms of a liver or gastrointestinal problem manifest in seemingly unrelated areas of the body. This is why it is important to be as precise as possible when answering your doctor's questions. After the doctor has collected information about your medical history and lifestyle behaviors, a physical examination to inspect the abdomen is performed. This procedure is called a abdominal gastrointestinal examination (abdominal GI examination). For the procedure, you will be instructed to lie down on the doctor's table for an abdominal GI examination. A doctor uses the palms of his or her hands to gently apply pressure to the skin of the abdomen in order to investigate the size and texture of the liver. The methods used for the examination are called palpation and percussion. These methods can help a doctor determine the approximate size and texture of the liver. These methods can also help a doctor detect textural abnormalities in the liver, including inflammation (hepatitis), masses, and nodules. If you experience any discomfort, pain, or tenderness while the doctor performs the abdominal GI examination, it is important to let him or her know. 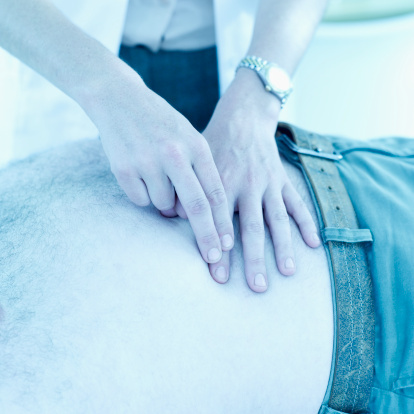 Symptoms such as ascites or jaundice can be quite obvious during a physical examination. The doctor may also observe your eyes, skin, and fingernails for some other common symptoms of liver disease. If you have noticed any changes in or on your body, be sure to let your doctor know.